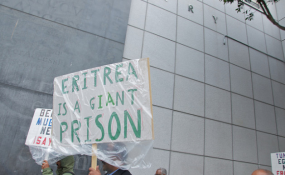 Free Eritrea democracy march in San Francisco (file photo). ARTICLE 19 welcomes the report of the UN Special Rapporteur on the human rights situation in Eritrea. We remain disturbed that the denial of freedom of expression, assembly and association rights remains "systematically entrenched" in Eritrea, as the Commission of Inquiry found last year. The silencing of independent media and critical voices has been central to, and has enabled, the Eritrean government's apparatus of repression, sustaining a climate of impunity worsened by a perpetual "state of emergency" and the absence of the rule of law. No private media have existed in Eritrea since the last eight private newspapers were forced to close in 2001, when at least 18 journalists and 11 former government officials (part of a collective known as G-15) were arrested on the pretext of 'national security'. These detentions have been condemned by two ACHPR decisions, the most recent in 2016 concerning Dawit Isaak. ARTICLE 19 estimates that a total of 69 journalists have been arbitrarily arrested and detained for exercising their right to freedom of expression since 2001, without charge or fair trial. While at least eight journalists are thought to have died in detention, a wall of silence means it is impossible to know how many others remain in prison, where they are, and what their condition is. Government-controlled media is the only type of local media in Eritrea: they act as a mouthpiece of the Ministry of Information. Access to alternative information sources, including online, is limited. We share the Special Rapporteur's concerns that since 2016, new regulations require Internet cafes to register customers before they can use the Internet. We also note that Eritrea's sole and government owned telecommunications provider continues to routinely block online news sources. Internet penetration levels, and Internet speeds, remain woefully slow. We again call on the Eritrean government to account for the whereabouts and wellbeing of detained journalists and G-15 political prisoners, and ensure the unconditional release of those that are still alive, and reparations made to victims or their families. We also call on the Eritrean government to end its policy of non-cooperation with the United Nations, including the Special Rapporteur, and to facilitate access to the country at the earliest possibility. The institutions that are needed in Eritrea to safeguard human rights can only be established with technical assistance, which will benefit the Eritrean people. This Council must renew the Special Rapporteur's mandate at this session, and ensure accountability for human rights violations in the country, including through referral of the situation to the UN Security Council. We also call on the African Union to establish an appropriate accountability mechanism without delay. This statement was originally published on article19.org on 14 June 2017.